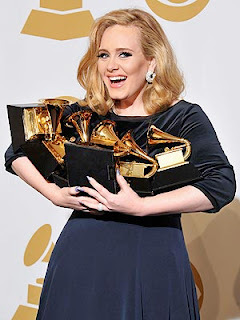 Adele emerged top winner at Sunday's Grammy Awards, winning six trophies including the prestigious trifecta of record, song, and album of the year. The night's other big winners included The Foo Fighters, who won five awards. Kanye West, who was nominated for seven Grammy's, took home four trophies. Taylor Swift also won two Grammy's for her song "Mean." Among the evening's performers were Chris Brown, Paul McCartney and Bruce Springsteen, Kelly Clarkson, Bruno Mars, Taylor Swift, Jason Aldean, and Katy Perry. Jennifer Hudson also performed "I Will Always Love You" as a tribute to Whitney Houston. In Concert On Broadway, Harry Connick Jr. The 54th Annual Grammy Awards Air This Sunday!